Everybody remembers him as the handsome, ever-smiling Governor of Lagos who was well-loved for his people-oriented policies. 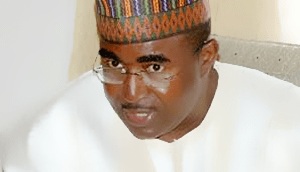 Brig-General Muhammed Buba (Marwa Rtd.) spoke to us about his tenure in Lagos. The Marwa family is 4 Generations of soldiers beginning with my grandfather who served in the Royal West African Frontier Force and then my own father who served in the Royal Nigerian Army and then my humble self and my son, now a Major, not forgetting my late younger brother who rose to the rank of Major General. I started my military career at 12, at the Nigerian Military School; I actually handled weapons, live firing at that young age. So the military blood is thoroughly in my veins. However as the saying goes the hood does not the monk make. So wearing military uniform, or being trained as a soldier does not affect someone’s facial disposition or calmness and stuff. It all comes down really to the individual character of the person and his philosophy. My first reaction was denial. At the time in 1996, I was Defence Attaché to the Mission of Nigeria to the UN in New York and it was my third year and I was trying to wrap up my tenure towards the end of the year and return home. As it happened, the day before the announcement was made, I was in Nigeria, I was actually leaving that day back to New York. I passed through the Villa to give my farewell to the then Head of State, General Abacha, but he kept sealed lips, he didn’t give me the slightest hint that they were going to make the announcement the following day. I went on to Kano to take my night flight and arrived New York the very day the appointment was announced. I got to New York about 1pm, by 2pm I believe I was home and after the prayers and the meal, I went up to bed immediately to wear off the jet lag. But within a few minutes my wife woke me up and said she had received calls that the government had made some postings and that we were being recalled and appointed to Lagos state as the military administrator. Immediately I told her somebody was playing pranks on her. That in any case I had just finished being Governor of Borno State merely 4 years ago, and in the Defence Attaché job I had been the first to be appointed twice at different occasions. In the past you had people who moved from one post to the other in Defence Attaché positions because in one streak, they were serving in Zimbabwe and then relocated to London for instance. But I had done the military attaché job twice separately, in the 80’s and now in the 90’s, so I thought I would be the last person to be appointed as Military Administrator again. But later, a couple of calls came through that confirmed the appointment. By that time there was no internet presence in Nigeria so you could not easily access the internet and get news on current happenings like on facebook, Instagram, twitter and likes. Like most military officers of my day, we all knew Lagos in a general sense, in my case, even more so because I came to Lagos as a child in 1964 where I concluded my primary school, then I went back in the 70’s to work at the Army Headquarters where I was privileged to be Aide de Camp (ADC) to then Chief of Army Staff, General TY Danjuma. In the 80’s I was back again to Lagos to work at the Armoured Corps’ Headquarters in Bonny Camp. The two things that came to mind by way of impression of Lagos and that was before my appointment was made, was that Lagos had a lot of security challenges and secondly the perennial hold-up (traffic). Certainly, as a military officer by training, you are an adaptive animal and are prepared for any posting. But more than that it was my experience as former Military Governor of Borno state that proved very useful in governing Lagos state. Well, it was almost like saying what is it that was not wrong with Lagos?. I am sure all my predecessors had all done their bits. I met lots and lots of challenges in practically all spheres – security, crime was rampart, violent crime especially, bad roads, inadequate housing, public transportation challenges, water supply problems, area boys, health care issues, education, sanitation, lack of funds, flooding and at the time, a lot of people were still talking (complaining) about the June 12 annulment and the Abacha government; I am talking about the activists. Clearly when you are faced with a multitude of problems as these, you may run into the problem of spreading yourself thin if you don’t prioritize especially when funds were lacking. Immediately I set off 3 priority areas; the first was security and that to me was the first thing to tackle because whatever you achieve, unless the citizenry feel safe and secure, that is all nonsense. Second priority was to sort out the bad roads and third priority was to broaden our revenue base so that we can have the wherewithal to execute our programmes. In my maiden address I expressed appreciation of the warm welcome which I received and I gave my assurances and commitment to serve diligently and of course I did state clearly in my speech that I will first focus on the resolution of security and roads challenges. The issues of road impacted on everyone because of movement, everyone moves from point A to point B by road in the ordinary course of livelihood – to work, to market, to schools, appointments etc and apart from the frustration of bad roads, you lose man hours due to holdup. And security-wise, the criminals stay at those areas they can ambush because of the bad roads, not to mention the effect of bad roads on vehicles. So I had to face up to these problems right from the beginning. Well, first of all I must say that during our time it was enforced, it was a very successful edict. I recall that when we enacted it we didn’t have commissioners. I remember the Solicitor General then, now Justice Okuwobi, assisted by Arthur Worrey worked very hard and crafted an edict which we believed would assist the downtrodden. It was mainly for a particular bracket of citizens. I could remember well those whose rent exceeded N250, 000 or so, were excluded. We thought that they didn’t belong to the people we wanted to protect but those below that were the focus, the face-me-I-face-you housing and similar types of housing. The areas of focus were Bariga, Shomolu, Ajegunle, Agege, Mushin, Isale Eko, Badia, Amuwo Odofin, Yaba, Ebutte-Meta and such. While reading for my Masters in the university, I recalled one of the courses I took had to do with public housing and stuff like that. They explained that it was difficult to do a rent edict that will work where the housing market was a sellers’ market due to scarcity. So you cannot do a rent edict that will work unless you provide sufficient housing stock to compensate. Bearing that in mind, we embarked upon housing estates and we built nine housing estates, two of which were started by our predecessors and I made sure they were completed and named after them (Otedola estate, Raji Rasaki estate). Majority of the nine estates we built were low cost. Six were low cost and three were medium, in Ikorodu, Ikeja, Lekki, Ojodu, Amuwo Odofin etc. We created rent tribunals and they were very successful in our time. I could remember that the edict was sold on the street at N20 per copy; people bought it to know their right. I didn’t set up operation sweep, Oyinlola my predecessor did. We only reinvigorated it and we had to do that taking a cue from similar experience in Borno. Eventually it became a template nationally. Operation sweep was so successful that one of my colleagues in the South East was going to launch his own version and he invited me to the occasion. I told him I would be unable to attend personally, but that if he didn’t mind, could I send a representative and he said no, that I had to be there myself. I asked him why. He said if I am there personally at the launching, all the armed robbers in that state will run away. Security like I said is critical and a cardinal area for any government to make sure they resolve. In a larger sense if you look at the present government, you see that one of President Muhammadu Buhari’s key policy areas is security of which he has made considerable success of it especially in effectively decimating the insurgents. The modus operandi of operation sweep at the time was first of all to fight in a responsive manner, meaning to fight crime aggressively and remorselessly. Once crime is occurring anywhere in Lagos we were able to be there with our patrol cars within 5 to10 minutes. We had about 400 patrol cars in total operating 24/7 and the heat was on for the robbers. I remember in December 1996, robbers actually wrote me a letter addressed through the headquarters of Operation Sweep which we fully publicized. They said it was Christmas; that I should let off a little bit that they want to celebrate Christmas because they also had families to feed, and we responded to that also publicly. Of the 400 patrol cars, we had a component of a secretive force of about 100 patrol cars, those cars were unmarked and the occupants were also in mufti and their purpose was to work with information to go after robbers. So the robbers knew we were hunting them down, we were not waiting for them to attack first. Remember we also created the Neighbourhood Watch in their thousands who operated in the communities and had radio sets. We had our security meeting every Monday where we reflected and determined what went on the previous week and what we ought to do in the current week. The last bit of operation sweep which was known only to me and I can now divulge was that it was also an anti-coup early warning arrangement. Apart from safeguarding the federal government of the day, I wouldn’t want to be sitting in Lagos House as Military Governor, tending to the affairs of Lagos State and ‘Some Criminal Soldiers’ creep up on me and shoot me dead in a coup attempt; nobody would like that to happen. So Operation Sweep by virtue of the way it operated with over 400 patrol cars working 24/7 around the nooks and crannies of Lagos, there was no way anybody of soldiers would move at some ungodly hours of the night to anywhere without my knowledge. I can also say now, that I had, with the permission of General Sani Abacha then, and as an Armored Corps’ officer, I actually positioned a Platoon of tanks directly under my command in Dodan Barracks prepared for any such eventuality. I must say that the Police and the Armed Forces did very well in Operation Sweep and they are to be commended. I remember very clearly as if it was yesterday, 16th December 1996. At that particular instance when it happened, I never thought it was a bomb blast or that it was an assassination attempt. Every day I normally leave my Isaac John residence to go to work at 8am more or less and I took the same route believing there was no threat. It was not as if I was unpopular in Lagos and so had to change my daily route to work and so on. This was a routine administrative job in Lagos as Governor. And I never did anything nasty to NADECO to say that somebody out there would try to assassinate me. In fact, throughout my tenure I never ordered the arrest, let alone lock up anyone. On this particular day at about 7:20am I discovered that I was all dressed up and ready to go to work. But my convoy was not set because they did not expect me to be ready at 7. 20 am – My ADC and my orderly were not yet out, only my Chief Detail was ready. We were not complete in the convoy but I said let’s go and we left. I believe that it was this early and unexpected departure, by the grace of God that caught those who were waiting for me at the ambush point unprepared. So we took our regular route to Alausa through Airport Road (Now Mobolaji Bank-Anthony Road) and soon after turning that corner of Sheraton Hotel, the blast went off right behind me. I heard the blast and I looked back and saw a huge mushroom of cloud of smoke and dust, and the first thing that came to mind was; was Julius Berger doing some repair works involving blasting on this road which I was unaware of? As soon as the cloud cleared I found out that there was no other car behind me, as my immediate back up security car which was positioned running almost parallel to my car had been blown. My car was now the last in the convoy. There were normally about 3 or 4 vehicles behind me and suddenly they were nowhere to be found. Instantly I thought that this must have been a targeted attack on me and the military training kicked-in. In such ambush situations, we were trained to charge through. Eventually I discovered that it was some agents of the federal government that tried to assassinate me but in my own mind and to this day I am quite clear that the head of state Gen. Abacha and his deputy Gen. Diya were unaware and not part of the plot. The federal government quickly made a statement that it was NADECO who did it and I knew that it was not. I was the victim, why was somebody now telling who attacked me? Shouldn’t I have been allowed to make that statement? So I went on to make a statement that even though I did not know who tried to assassinate me, I knew who did not. And I said definitely it was not NADECO. That put me on the war path with some of our senior administration colleagues. On that day we had an event with the Family Support Programme. I went up from the scene to the hospital to see those who were injured in the bomb blast and from there we went and continued our programme for 10am. There were spates of bombings after that, in fact two days later i.e on 18 December, a bus carrying soldiers was bombed close to my office, in which a soldier was killed. There were also several more bombings outside the military cantonment in Ikeja, Base Workshop, Yaba and so on. In my opinion those other bombings were arranged to mislead the public that it was NADECO going after the Army instead of targeting one man, myself. I would think that had this assassination attempt (against Marwa) succeeded there would have been no further bombings. The report was absolute rubbish. I was not and could never have been a or the bomb courier. Sometime in 2009 I remember very well, I was sitting at my desk as High Commissioner in South Africa when my PA brought to my notice that a man, I don’t recall his name now, had written an article; that he met one military officer in New York who told him that it was I that carried the letter bomb. This was 23 years after the Dele Giwa bomb incident!!! I had returned from Harvard in July of that year after my graduation and was actually far away from Lagos at the period of the Dele Giwa incident in command of the Army’s Test battalion Field Training Exercise (FTX) in Azare, Bauchi State. Each year, one battalion is selected from the Army Headquarters to do a Test field training exercise (FTX). It was the turn of 3 Armoured Division to do the FTX for that year (1986) and my battalion, 233 tank battalion, of which I was the Commanding Officer, was selected. The exercise code-named ‘Exercise Gwada-Karfi’ ran from September to December, that year. When Dele Giwa was killed it attracted national attention if not international attention and whoever delivered the parcel would have been seen by members of the household or the gatemen (certainly who ever delivered the parcel handed it to someone and there was no report that he was wearing a mask). For me to have served as a Military Administrator of Lagos state for three full years; even winning the ‘Man of the year 1997 award’ from the NewsWatch magazine, would it not have been very absurd that no one in the Dele Giwa household drew attention, recognized me as the person who showed up that faithful day carrying a bomb? And all those years that the case went up all the way to the Supreme Court? Until 23years later, some ‘crackpot’ comes out of the woodwork and lays some abnormal claims!! Please give me a break. What utter nonsense and rubbish!! To this day, I have been unable to locate the man who made this claim nor the reason behind making it – now I remember his name, Ogunade – but at least I found a response from Professor John Amoda, Emeritus Professor in the Department of Political Science, City University of New York who knew Ogunade personally. The Professor wrote a strong rebuttal entitled “Dele Giwa, Buba Marwa, John Amoda In Ogunade’s Fictive Account of History-An Explanation” which can be googled, or found in saharareporters. John Amoda’s piece thoroughly destroyed Ogunade’s thesis and showed that Ogunade needed the attention of a psychiatrist. Actually that was my most challenging period in Lagos. The day Abiola died we were in Abuja preparing for a joint Council of State and Armed Forces Ruling Council meeting the following day. Sometime between 5 to 6 pm on that fateful day, I got a call from the Villa that the Head of State, General Abdusalami Abubakar wanted to see me. He was still living in the residence of the Chief of Defence Staff, at Niger Barracks. I went up there and immediately I was ushered in he told me that Chief MKO Abiola had died. Immediately I heard the news I said I needed a plane to go back to Lagos because Lagos will be on fire when this news is released and at that time he said the news had not yet gone out. That same night I called an extra-ordinary security meeting of which in attendance were the Oba of Lagos, DSS, CP of Police, Army/Navy/Airforce appropriate Commanders and so on, I remember Cardinal Okojie, Archbishop Adetiloye, Archbishop Sunday Mbang were also in attendance. They all made meaningful contributions. The whole purpose was on how to douse tension and bring Lagos back to normalcy. In the morning information came to me that the disturbances had spread and that they were going after northerners, killing them at sight. I also got a call from a particular northern Emir that they got information that this was happening in Lagos and that there will be reprisals in the North and I assured him that I will deal with it. So I decided in my security meeting that morning to take the bull by the horns and go out to the streets myself. I was advised against going out by the security council as the climate was not conducive, disturbances were ongoing throughout Lagos and there was still the killings going on of Northerners and their houses being torched. There and then I told them that anyone who did not want to follow me to the street was free to drop out. Quite a few dropped out. So we went out on the street, directly through persuasion and by the grace of God we were able to calm things down at the end of the day and end the killing spree.